For over 30 years Doug Spowart and 20 years for Victoria Cooper, have participated in training for creatives including artists and photographers. The pair has lectured in art and photography at TAFE colleges, universities, workshops, conferences and seminars for students, amateurs and professionals alike. Now, during April, May and June, through WOTWEDO.COM @ Brisbane’s Foto Frenzy, they offer a range of specialised & bespoke training and consultation services. Both Doug and Victoria are Masters of Photography and Honourary Fellows of the Australian Institute of Professional Photography (AIPP). Throughout most of the 1990s Doug was the Chairperson of the AIPP Professional Photography Awards. 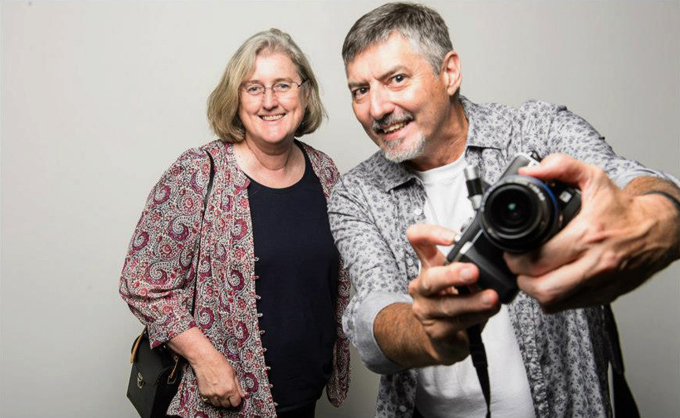 In the mid 2000s both Vicky and Doug were involved as AIPP representatives in writing national photography TAFE level curriculum for Certificate and Diploma of Photography programs. In the last 10 years Victoria and Doug have engaged in part-time university study in photography and the world of artists books and art. in 2013 Doug and Victoria are taking a sabbatical from TAFE teaching to pursue post-doctoral research and to re-engage with their arts practice. These workshops are part of their ‘Leap of Faith’ initiative that was introduced in their earlier blog post. Do review their WOTWEDO workshop program and see WOT-THEY-CAN-DO for YOU! Is your photography becoming formulaic (predictable) and more about digital technology and post-production than about the hands-on experience of taking photographs? Do you want to investigate possibilities of making a personal style beyond Instagram, Lomography and Hipstamatic filters? This series is crammed full of projects and ideas that will present you with challenges, weird stuff, things you’ve heard about but never had the chance to try, and things that require a rush of the creative thought juices. Use this workshop to reconnect with your love of photography. Dates (Tentative) 6 Sessions: Monday, April 15, 22, 29 and May 6, 13 & 20, 2013. By now everyone has made a photobook and in many ways current technology makes it easy to make one. But a photobook can be so much more – it can be a hand-made artwork or a super-slick prestige trade styled publication. The Looking Good in Print: Photobook introductory session and workshop series will connect participants with concepts and techniques on how to personalize and create photo-stories in the form of the bespoke self-published photobook. The range of options for making photobooks will be discussed and samples of hand-made, inkjet printed and hand-bound artists’ books, print-on-demand books will be available for viewing. Dates (Tentative) 5 Sessions: Wednesday, April 10, 24, and May 1, 8 & 15, 2013. When you Google yourself, or your business, what kind of response do you get? Is your online presence a bit thin or based on content from Facebook, a website maybe, and a few social mentions? This introductory session and workshop series is designed to help you to start developing an integrated online presence. It will illustrate how an integrated approach to using platforms like Linkedin, WordPress Blogs, YouTube and Behance Folios can create a ‘wall’ of search engine locatable, quality references and social media mentions as to who you are and what you do. Dates (Tentative) 5 Sessions: Tuesday, May 21, 28, and June 4, 11 & 25, 2013.